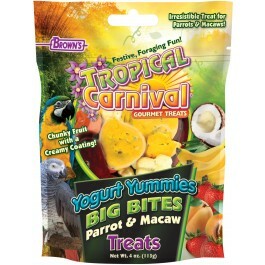 Tropical Carnival® Yogurt Yummies™ Big Bites Parrot & Macaw Treats are made with a medley of chunky, natural dried fruit pieces. We start with hand-selected fruits like luscious apricots, bananas, sweet red strawberries, scrumptious coconut and then enrobe them with creamy yogurt in a variety of colors. 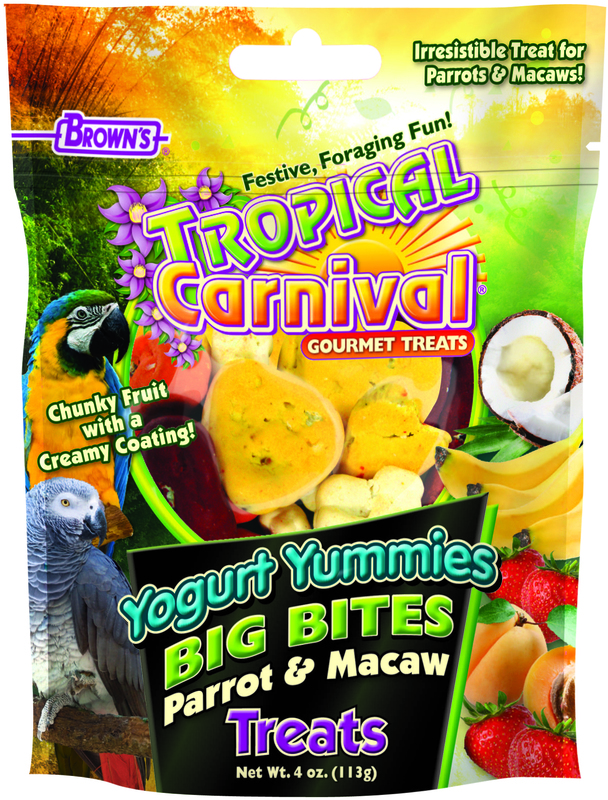 Yogurt Yummies™ are irresistible snacks, treats or rewards that add variety to the diets of large parrots and macaws. Big Bites are an exceptional treat for extraordinary birds in the just the right sizes for their big beaks. There are lots of big, chunky, hearty, wholesome pieces. 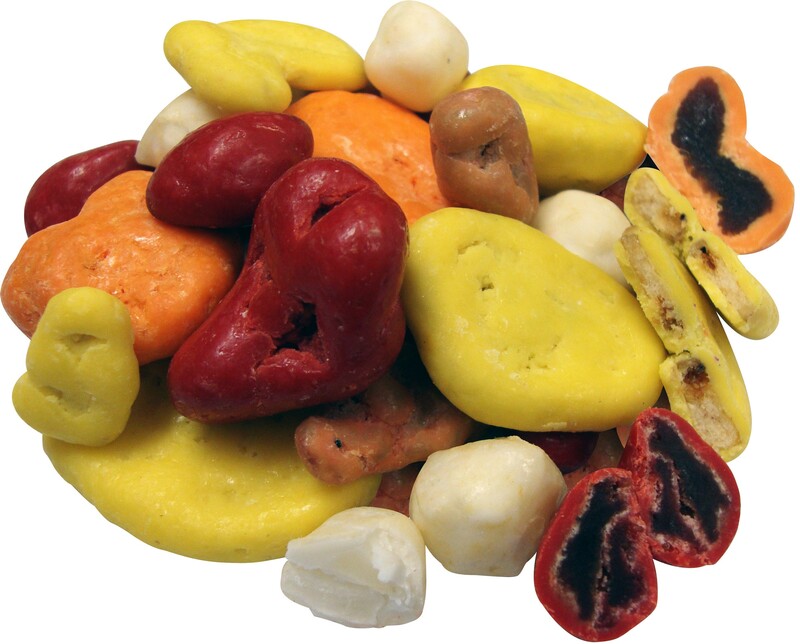 All the fun shapes, sizes, colors and textures make this a stimulating treat that big beak birds will love to eat! • Great treat to use in foraging toys! • Chunky fruit with a creamy yogurt coating! 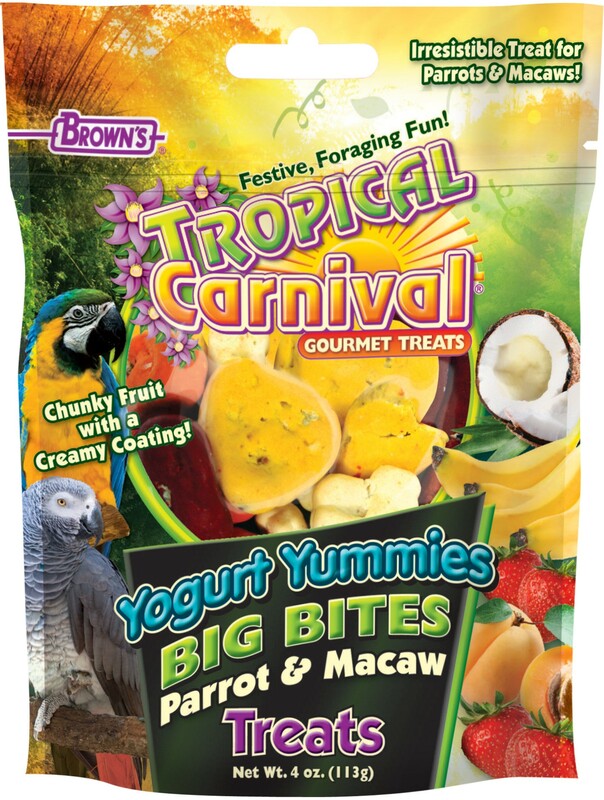 • Irresistible treat for parrots & macaws! Dried Apricots, Dried Banana, Dried Strawberries, Dried Coconut, Sugar, Partially Hydrogenated Palm Kernel Oil, Nonfat Dry Milk Powder, Yogurt Powder Heat Treated after Culturing (Cultured Whey and Nonfat Dry Milk), Lactic Acid, Soy Lecithin (added as an emulsifier), Vanillin (Artificial Flavor), Titanium Dioxide, Red #40, Yellow #5 and Orange #6.